Thorpe-le-Soken is in the Tendring Hundred of north-east Essex. The area was granted to the Canons of St Paul's Cathedral before 941 AD and this was confirmed by Cnut (King Canute). The area was then known as Edulvesnaesa - Aedulf's nose. Much of the promontory which formed the 'nose' has long since been reclaimed by the sea, The original settlement of Walton with its old parish church is said to be more than five miles out from the present coastline. Because the area had been granted to St Paul's, the area became known as Paul's Soke, and the loss of land to the sea is a fact recorded on a Canon's stall in St Paul's Cathedral with the inscription 'Consumpta per Mare'. In days long gone by, the Prebendary who sat in that stall was no longer required to do his duty of preaching in the cathedral because his old endowment at Walton had been consumed by the sea. The particular jurisdiction and administration which is referred to in our village's name was as we have seen, Saint Paul's Cathedral. This also included the neighbouring parishes of Kirby-le-Soken and Walton-le-Soken (Walton-on-the-Naze). The history of the Soken is a long and interesting one to which this website cannot do justice. Suffice it to say that in the 16th century it passed into private (secular) hands and was eventually wound up in the late 19th century. The last Commissary of the Soken was the Reverend William Burgess, vicar of Thorpe, Kirby and Walton, who enjoyed the rare privilege of raising a local tax for the repair of the churches, granting marriage licenses, issuing faculties for the repair and alteration of his churches and presiding over an Ecclesiastical Court in his own parish church; judging on local matters for the three parishes. Burgess remained vicar until his death in 1862. The last Soken Court was held in 'Thorpe Church' in 1861. The Parish Church - Saint Michael or Saint Mary? By the 20th century it must have seemed as if 'Thorpe Church'', as it was usually known, had always been Saint Michael's. Oddly enough, the next door parish church of Kirby-le-Soken is also St Michael's and neither of them are St Michael and All Angels. It seems possible that in the days when both had the same vicar and were usually known as 'Thorpe Church' or 'Kirby Church' that there was no real change of dedication, maybe just a mistake or oversight on some document. Alternatively, it has been suggested, by Dr Wood among others, that St Michael was more in keeping with the low church evanglicalism of the time. Anyway. St Michael's it has thus far remained. Dr Wood's book gives more detail of the inventries. Explanations of the various items of the ecclesiastical paraphernalia can, if required, be found in the Oxford English Dictionary. One of the questions people frequently ask is: 'How old is this church?' The answer is that we don't know, but from historical sources we know that there was a church here in 1147 which was granted by the canons of St Paul's to Thomas the priest for 3 years at a rent of one mark. All the information we have from before that date is that the charter of the abbey of St John in Colchester dated 1119 refers to the 'tithes of Torp', which is quite likely to be Thorpe. 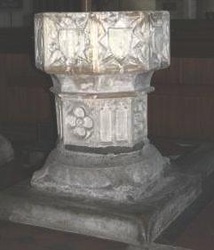 The only material relic of this early period is the base of the font. This doesn't necessarily mean that either of these dates marks the beginning of this church. It is not unlikely that there would have been a church here from the tenth century as that is when the Soken dates from. It has long been assumed that there must have been a church here in Saxon times. Much of the mediaeval church was taken down in 1875 and a 'restoration/rebuilding' took place, to the plans of a well-known Victorian architect, William White of Wimpole Street, London. White was responsible for a number of churches in England, in Cornwall, where his practice started, and in various parts of the country including London. He also built several schools, grand country houses and a handful of colonial cathedrals. Among White's churches is the now redundant church of St Saviour, Aberdeen Park, Islington, made famous by John Betjeman who attended there with his parents as a boy. His poem about St Saviour's begins, 'Great red church of my parents...' Like many of White's churches, St Saviour's Aberdeen Park was built in the polychromatic style of brickwork favoured by the more famous William Butterfield. Saint Saviour's bears little similarity to Saint Michael's, except for the east window tracery and choirstalls which are of virtually identical design. Like Butterfield, White was heavily influenced by the Oxford movement and this is reflected in his churches. Where crosses were not allowed on altars, they tended to appear on east walls or on reredoses as part of the church fabric. This is true of Butterfield's Keble College Chapel, his All Saints, Margaret Street and others. The oak reredos in St Michael's, has at its centre a cross, part of the framing of the oak-boarded panels. The reredos consists of three sections, the central and original panel designed by White and the two side sections which were added in the 1920s as a Leake family memorial. The architect's drawings show that the reredos was meant to be painted and this inlcuded a stepped cross, painted onto the crossed oak members at the centre. Although under the Reverend Abraham Henly Rumboll, the vicar at the time of rebuilding, Thorpe was not as Low-Church as under his predecessor, William Burgess, it was probably still a little too 'low' to go in for crosses, even behind the altar, or for the elaborate painted patterns with which White planned to illuminate the reredos. So it was left and still remains dark brown oak. The rebuild was completed in 1876. What has survived of the mediaeval church is the outline of the building which hasn't changed apart from the addition of the choir aisles, the c. 1500 tower, the north aisle and porch with muniments room above, also c. 1500, the little square-headed door to the muniments room with re-used 13th century hinges, the Norman base of the font, 14th century font, 13th century effigy of a knight, elaborate 14th century arch relocated in the chancel and married with the 'Knight of Landeremere'. 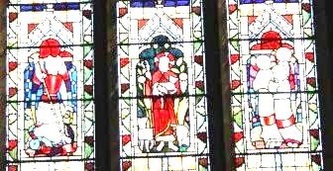 The windows of the north aisle are White's copies of the original windows. The walls of the north aisle, believed to have been red brick were re-surfaced in septaria, flint and rubble to blend with the rest of the 19th century exterior. The interior plaster of the north aisle is coarser and more uneven than that of the rest of the building, suggesting that it was not re-plastered in 1875-6. The decayed 16th century roof beams of the north aisle are, since a recent restoration, now supported by a new set of beams hidden above the ceiling boards. White also managed to retain 14th century roof beams in the nave whilst replacing the old brick arcades bebeneath with carved stone. Anything that could be re-used from the old building was employed including stone and possibly some of the old pews which may explain the panelled boards beneath the seats of the present pews. Some of the panels have numbers painted on them which was common in the days when pews were rented. The nave roof was boarded in the 1950s giving it the appearance of a barrel roof, in fact one book on Essex describes it as a Victorian barrel roof. White's original arrangement was lathe and plaster between the rafters. The various items of door-furniture, latches, hinges and other metalwork, including cast iron rainwater-goods are all made to the distinctive designs of the Victorian architect, William White, who was also an inventive and ingenious innovator. 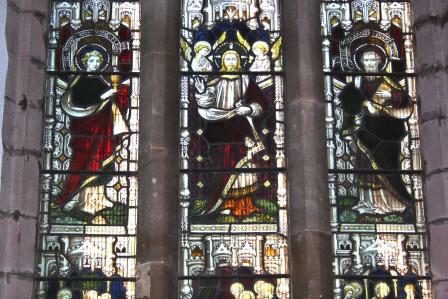 In some churches White introduced double-glazed stained-glass windows, concrete filling of cavity walls, painted (stenciled) decoration on brickwork, and herring-bone wood-block flooring, of which he was a pioneer. St Michael's has an example of his wood-block flooring in the north choir aisle (vestry) albeit carpeted over for many years. 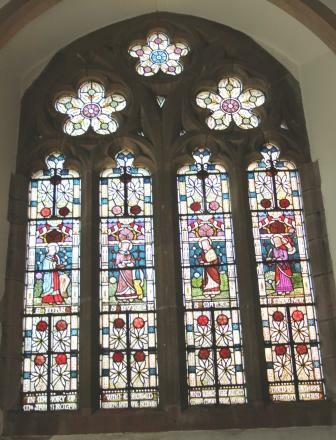 The two stained glass windows in the sanctuary, the East Window Good Shepherd and Angels and the small window south of the altar The Resurrection are designed by William White in memory of members of the Martin Leake family. 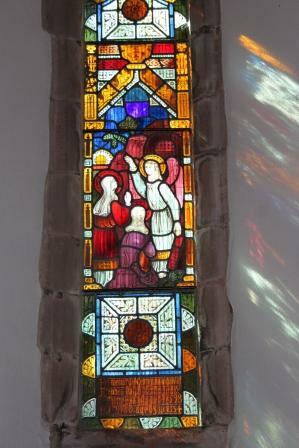 Another window by White is at the west of the south aisle in the Community Room. 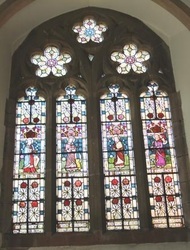 This is a Four Evangelists window and is the memorial to James Rolph, founder of Rolph Church of England Primary School. White's stained glass is not notable for its beautiful images, the human beings and angels are basic, to say the least. However, for overall design and colour they have an attractiveness of their own. Members of the Gull family are commemorated in a window in the south aisle, near the organ - St Luke, the 'Beloved Physician' being a reference to the eminent Victorian physician, Sir William Withey Gull. 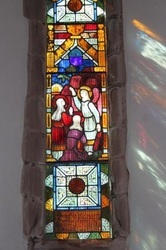 Next to this is an Archangels window representing the Archangels Michael and Gabriel. These latter two windows are said to be by Clayton and Bell. Effigy of knight in chain-mail with a long surcoat. Dating from the 14th century there is, on the south side of the choir, the recumbent effigy of a knight in chain mail which is set into an intricately carved arch of approximately the same date. Unfortunately, the effigy is totally sandwiched between the choir stalls and the organ and can only be viewed from the choir stalls. The present Binns organ, brought here from the redundant St Giles Church in Colchester and installed in 1955, fills the south choir aisle, whereas its smaller predecessor allowed viewing of the effigy from that aisle. Neither the 'knight' or the arch are in their original position and theirs is a marriage of the 1870s, nevertheless there is still to be seen a beautiful and well-preserved arch and an historic if rather battered 'Knight of Landermere'. The effigy may well be that of one John Filiol of Landermere Hall, who stated in his will in 1389 that he wished to be buried in the aisle of Thorpe Church. It is known that as late as the 18th century this effigy was under the easternmost arcade of the south aisle, near where the pulpit now stands. Before the rebuilding of the 1870s it was in the vestry at the rear of the south aisle. It is also known that in 1640 and in the 18th century there hung over the effigy a tabard of a later date than 13th century which was adorned with heraldic devices. The tabard is believed to have been much later than the tomb, so perhaps this was an earlier marriage. The Bachelor's Screen The archway leading to the north choir aisle contains an early 16th century screen known as the Bachelors Screen, so-called because it is inscribed with the words "This cost is the bachelors made by ales, ihesu (Jesu) be ther med." Dr Wood writes: 'Angels support the scroll and and shields bearing a chalice and host, crossed swords of St Paul and Keys of St Peter. The inscription contains a pun; meed means reward, but mead was the beverage often consumed at church-ales, the mediaeval equivalent of a bazaar, or garden-fete, or coffee morning for raising funds.' Before the installation of the present Binns organ in 1955, the screen was in the archway into the south choir-aisle, now occupied by the organ console. As both choir aisles were completely new in 1875-76, neither of these archways could have been the original site for the screen. Re-pewing plans of 1827 show the layout of the church as it was before the rebuilding - this plan and the plan for the rebuilding can be found online by visiting 'Church Plans Online'. This fascinating website has ground plans of churches throughout the land which received grants from the Incorporated Church Building Society. The Bachelor's Screen was then (1827) sited at the south east corner of the church to partition off a vestry. Dr Wood mentions that one bay of the screen has been removed and that this must have been done to put it into the organ chamber arch. He speculates that it must have been the Rood Screen which would have originally separated the chancel from the nave. But the plans of the mediaeval church and the only known photograph of the building as it was pre-1875, show that, apart from the addition of two choir aisles and the height of the south aisle roof, the church was exactly the size it is now. 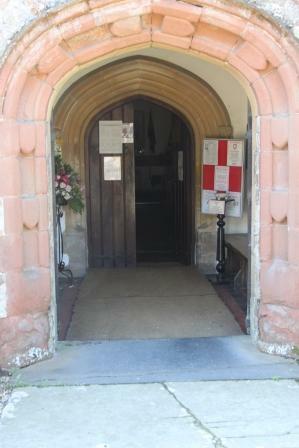 This includes the entrance to the chancel. The Bachelor's Screen has lost one bay but even complete it would be far too small to fill the space. It is much more likely that the Screen was used to separate off a small chapel in one of the aisles. Regrettably, it has received a coat of dark varnish at some time, probably when it was moved to its present position. The roof of the nave is at first sight misleading. It looks like and and is to all intents and purposes, a barrel roof. The boards which make it into a barrel roof were put up in the 1950s when the lathe and plaster panels between the rafters were becoming a problem. The roof timbers that can be seen, are of very much earlier date. William White, quoted in the Colchester Mercury of 14th October 1876 after the re-opening of the church, reported that the main timbers of the 14th century roof had been repaired and some replaced and mutilated figure heads of hammer beams made good. But, says Dr Wood, in his book, A History of Thorpe-le-soken, Hammer beams were more characteristic of the next century. Whoever was right, the main roof beams that can be seen from the floor of the church are really quite old. The 'figure heads' are at two levels: the lower ones, in contact with the walls are crowned heads on the south side and bare heads on the north side and appear to be of various dates, some appear to date from 17th - 19th century; the easternmost crowned head may be intended for Queen Victoria, whilst a few look very old. The heads at the higher level seem to have fared better and among a selection of what appear to be lions, demons and semi-human faces, there appears a lady in mediaeval head-dress. No detailed examination of these 'figure heads' has taken place in recent years. The chancel roof with its carved angels dates from the Victorian restoration.